As I had mentioned yesterday, the only things that The Beatles In Mono box set didn't contain were the albums that were only released in stereo. For whatever reason, you have to buy those separately. As far as full lengths go, that meant only having to pick up Let It Be and Abbey Road. Maybe I'm in the minority, but neither of these two rank all that high on my list of favorite Beatles albums. The issues that plagued Let It Be during its recording are pretty well documented and I think the general consensus is that those issues bled through to the quality of the album, so my feelings are probably echoed by some. However, I definitely seem to lack company regarding my opinion of Abbey Road. Many view it as the exclamation point of their career; that one last stab at greatness from a a band that will likely never be equaled. I think it's OK. There are a handful of songs that you could even say are pretty great, but if you set it up next to virtually ever other album in their catalog, I'll likely favor that other album (sans Let It Be). 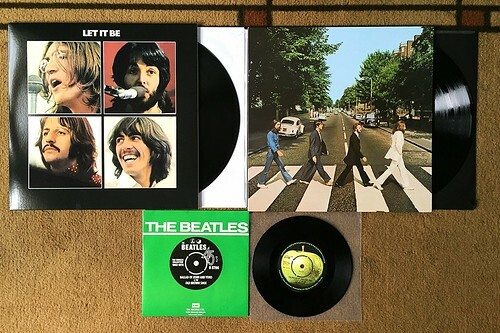 I have a soft spot for Let It Be because it was the first Beatles record I owned, Apple label and all, abandoned by my oldest brother when he moved out. However, when looking it it without the nostalia-tinted lenses, your analysis is pretty spot on-not very cohesive, and you can see the machine starting to come apart. Abbey Road was never a favorite for me, either-two songs I love ("Something" and "Here Comes The Sun") with a handful of other songs I think are ok. It was sad that the band never reconciled, because while the solo efforts all have some gems, they never approach what they achieved as a band. Plow United - Everything 7"
Holiday Weekend - Buy PopKid Stuff! V/A - Condo City Noise 7"